Finding fossils can often be a challenge, but extracting these fossils can be even harder: take this large ammonite (figure 1) in the Tramau River, Kachchh in India as an example, which took three people about one hour of work each. Figure 1: Photograph of a large ammonite in Tramau River, Kachchh Basin, India. Feet for scale. Microfossils, on the other hand, can be much easier to find due to their abundance and good preservation, so the likelihood of finding them in any sedimentary rock is high. 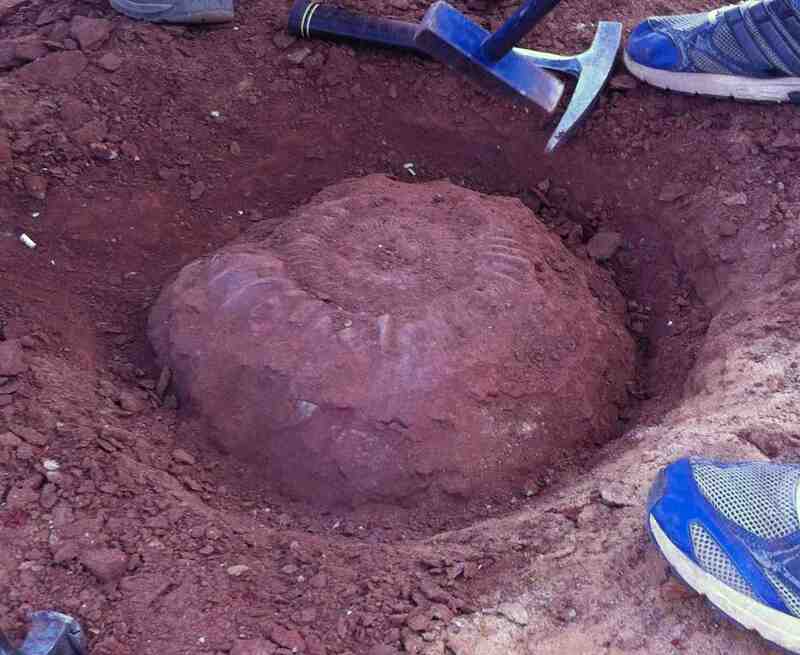 However, their extraction from the rock can be just as difficult as chiselling this giant ammonite out of the bed rock. Some of the chemicals used to extract them can damage the fossils whilst others aren’t very effective (figure 2). It is important to extract the truest possible representation of the microfossil assemblage as these microfossils are an invaluable tool as a proxy for palaeoenvironmental change. The importance is due to their sensitivity to changes in the environment such as light, temperature and salinity. Figure 2: Histogram showing the percentage disaggregation of samples to the size fraction that foraminifera can be extracted from (smaller than 500 microns) from different methods. Why do we need to be concerned about damaging microfossils though? An assemblage of microfossils is already prone to biases based on deposition and preservation due to biotic and abiotic conditions such as predation and ocean acidification especially on calcitic microfossils. The group foraminifera, which are protists that form a test made from calcite (or aragonite), silicate or detritus they pick up (known as agglutinates), are one of the most commonly used microfossils for reconstruction past (and present) environmental conditions. In order to reconstruct these conditions we need to have the truest possible representation of the original assemblage (there is no way to avoid the natural taphonomic and deposition biases). Foraminifera can be easily extracted from unconsolidated sedimentary deposits by washing in water, however for foraminifera preserved in compacted rocks extraction can be difficult. Mudrocks and shales, both of which are compacted, are widely considered to be one of the hardest materials to extract foraminifera from, but few publications have quantitatively compared different extraction techniques. 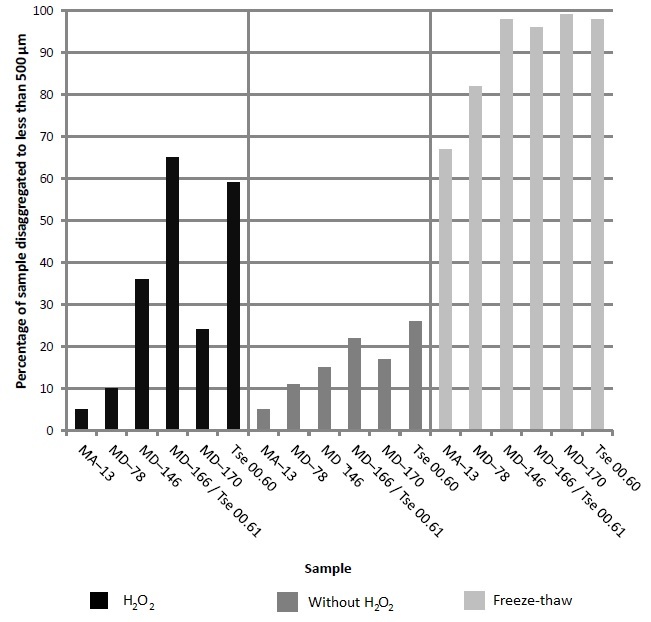 Our recent paper tests a range of extraction techniques and develops the freeze-thaw method. We tested several well-known methods of extracting foraminifera out of mudrocks from the Jurassic in order to ascertain which gave the highest degree of disaggregation and yielded the most foraminifera (causing as little damage as possible). Commonly, researchers have used hydrogen peroxide, but we found no obvious advantage to the degree of rock that was broken up (figure 2) although we did find that hydrogen peroxide damaged, and in some cases, possibly dissolved the foraminifera. Our results showed that this damage was sufficient to cause a dramatic loss in the abundance and diversity of foraminifera extracted from samples of mudrock broken down using hydrogen peroxide. We also found evidence of damage caused by hydrogen peroxide on some pyritised microgastropods (figure 3). Figure 3: Scanning Electron Microscope image of pyritised microgastropods which were extracted with hydrogen peroxide (a) and without and using freeze-thaw techniques (b). The best method we tested proved to be the repetitive freeze-thaw which broke down the majority of rock, regardless of its lithology or geochemical characteristics. Why does this matter for mudrocks? The period of time we were studying corresponds to a period of extreme environmental change in the Lower Jurassic (the Toarcian Oceanic Anoxic Event) in which mudrocks rich in organic matter were laid down. Other periods of extreme environmental change are also associated with deposition of organic-rich mudrock. Previous research has defined this Toarcian event as having an interval that is barren of foraminifera. We are concerned that this barren interval may have been an artefact of using hydrogen peroxide or at the very least accentuated by the use of such a potentially damaging chemical. To date our results have extended the range of one species prior to the onset of anoxia and further work is ongoing.